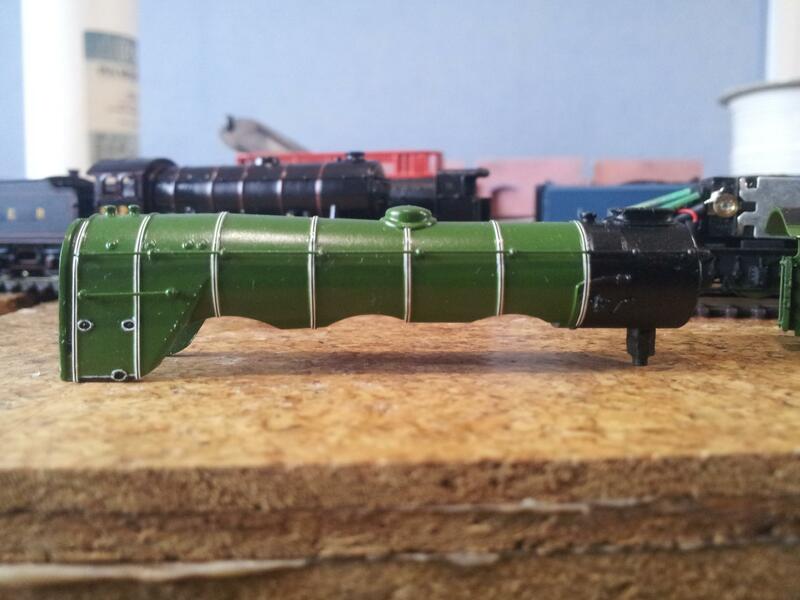 Anyway, progress is still being made with the locos but I'm starting to lose the will to live with their tenders! 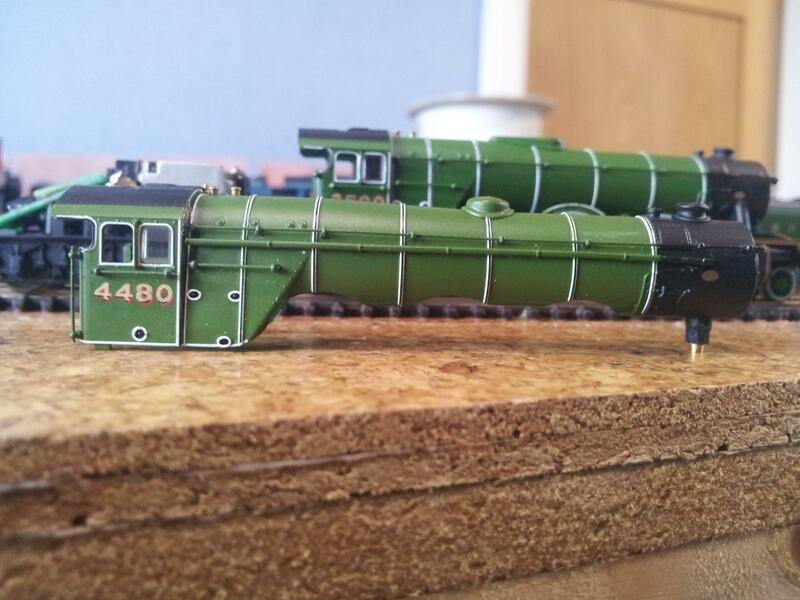 Both the D49 tenders are likely to have to be reprinted as they've warped (I don't know why). So in the meantime between adding boiler bands to the BR Hunt and lining up the last few bits and pieces on the Shire, I thoughts I'd turn my attention back to some planned and/or stalled projects. 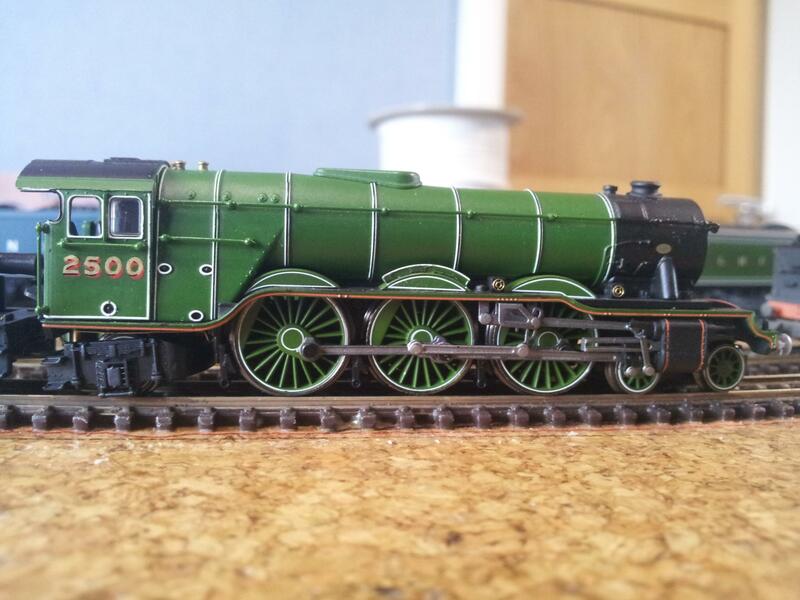 Above is one of my Papyrus models now fitted with a spare Scotsman boiler and well on it's way to becoming Windsor Lad. Strictly speaking Windsor Lad should have a banjo dome rather than the later streamlined version but I can live with this. I see that this model is displaying the crooked running plate that Dr Al describe when the A3s first came out. I'll have to look back over his threads to see how to correct this. This has now been renumbered as 4480 Enterprise - being a Star Trek fan, it's a must! There is a category B Papyrus heading my way tomorrow which was cheaply purchased from DCC Supplies. Unfortunately none of the Dapol A3s can correctly represent Enterprise in 1930's condition so the boiler is in the process of being modified - can anyone spot the big change? Finally, Humorist's boiler is finally receiving some boiler bands! I'm going to have to reexamine the boiler as a couple of the bands don't look quite straight in the photo above. Once these are done I'll have five A3s in the fleet and all will be slightly different from the others. I'd love to model a couple of the original A1s but I'm not sure about removing the superheater covers on the smokebox - once I've got my hands on another spare round dome boiler, I'll have a go at removing them. The big change on 4480 - is it to right hand drive? Paul you need to encourage the DO to take up a hobby that is complementary to your's. 1) If you want him out of the house, tap dancing or singing in a choir (choir free, tap shoes £100 ?). 2) If you can tolerate it "chez vous" painting (artistic painting that is) or learning a musical instrument. Painting (£150 for an easel and he could share your paints) is cheaper than a musical instrument. I'm suggesting that you buy the DO something that he can build... and then play with the toy dolls!!! 'Beam me up Scotty' is one of the most famous phrases from the original series but interestingly never actually said in any episode - although Shatner did use a couple of variations in a few episodes. You are, of course, correct Roy. This will also mean that I'll have to move the reversing rod on the footplate to the right hand side as well. The removing of the steam pipe left some holes that needed to be filled. Not wanting to repaint the whole model, I've patch painted the affected areas with Precision Doncaster green which, while not an exact match, isn't far off (well done Dapol with the colour match) and I'm sure will be hidden once a coat of matt varnish and a little weathering is applied - shame the B17 is a completely different story with regard to the shade of green used. I really wanted to model Enterprise with the early GNR tender with coal rails. However, trying to find a cheap Grand Parade or suitable spare tender in apple green is difficult. Luckily, I have found one picture from the late thirties which shows Enterprise towing a high sided non corridor tender as modelled with Papyrus so I can still claim that the loco is reasonably accurate! I really wanted to model Enterprise with the early GNR tender with coal rails. Your A3 does look to have a very bad front down lean - seen a few like this, and most have it to some lesser extent - also causing the rear bogie to be all floppy and sit at the wrong angle. The eccentric rod crank is pointing the wrong direction too - really some of Dapol's assembly is pretty terrible. Lovely work there Alan. Unfortunately, BR didn't do a later crest with apple green! I agree that the footplate angle leaves a lot to be desired. Reading up on your comments on 'the other forum' this seems to be due to the rear screw fixing. I can see from your Enterprise that curing the running plate issue really makes a difference to the Cartazzi truck. Do you have any further information on your fixes please? Anyway the simple bits, unscrew the existing boiler, remove the bits around the running plate involving the reversing gear, stick those bits onto the right hand side of the loco and attach the previously modified spare boiler. There is still quite a bit to do (other than Dr Al's mods), nameplates are the most obvious but I also need to paint out the green valance (never painted like that in LNER days) and remove/replace the lettering on the tender to match the cab numbers and patch paint the running plate where I removed bits. If I'm being really picky the reversing rod under the footplate should be the straight type but I'm not overly worried about this. Finally a shot alongside Windsor Lad showing just how many variations within the A3 class there were. Having gone over several of these, some are very very out, and even working on the rear end doesn't cure it fully. I've also gone further and moved the front mount. This is the frame spacer at the front of the chassis block - I've removed material from this piece's mounting screw bosses and locating lugs to raise it up thus hauling up the front footplate. The coupling socket should clear completely the front bufferbeam - there's should be air between it and a bufferbeam that has the cutout filled in. If lower than that then the loco's probably still leaning. Pretty little green Caterpillars when do they turn into butterflies? Actually they are rather good, I wonder if I might return from my pending trip to Cornwall with one? When I've finished messing around with them! You know you want one! However it seems that Dapol hasn't produced any LNER A3s other than Scotsman (and non represent the locomotive as it was pre 1947) for awhile now. Still good condition second hand examples can be found for reasonable money if you hunt around a bit. Thanks Alan, I'll investigate this with Humorist as it is already in pieces for the repaint. I think I understand all from the above but would you mind if I come back with questions if I get stuck? With regard to the bufferbeam, did you repaint the whole thing or did you find a good paint match? Steam pipe removed and superheater header covers on the smokebox carefully sanded off and I've got a reasonable representation of the earlier A1 boiler. To be strictly accurate the upper row of boiler plugs should be altered but I'm not going there. As you can see, I've had to remove the handrails to get at the heater covers and a quick patch paint shows that there is a little more filling required where the steam pipe used to be. While Enterprise's boiler gave up it's steam pipe without too much fuss, this one was very well glued in place and I've lost all the fixing points on the steampipe. This shouldn't be a problem but will require some careful lining up and gluing. The handrail knobs were also destroyed but can be easily replaced and I've saved the original handrails for templates when making new ones. As the replacement handrails and knobs are metal, I'll have to patch prime these before repainting, does anyone know of a good brush on metal primer? As with most of the other conversion, I'm going to try and avoid a full repaint if possible. I was surprised when a rummage through my spares drew revealed that I'm the owner of yet another Papyrus model that I'd forgotten about. This one was purchased very cheaply for spares as the plastic rivet holding the little end of the con rod to the piston rod had broken. DCC supplies do sell replacement valve gear but only for the right hand side of the locomotive - guess which side is broken! 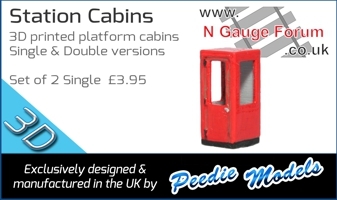 I think I'm going to be begging DCC Supplies to sell me a replacement for the left hand side as it would be great if I can repair this and actually own a proper Gresley A1! No prizes for guessing which one and I've already got a spare corridor tender to hack modify into 1928 condition. 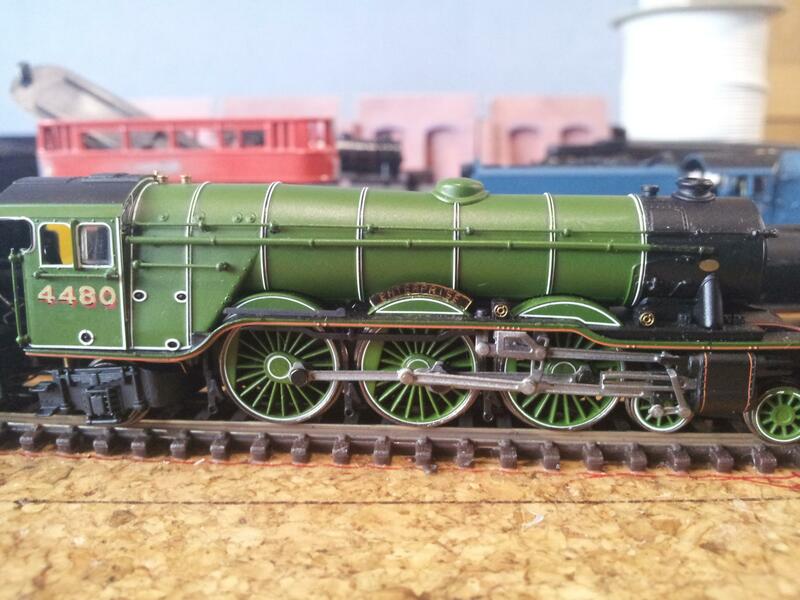 Not bad for a morning's work but now I need to get back to adding boiler bands to other models! Enterprise has received her first nameplate today. This is homemade and I'd like your opinions if I should keep it or buy some etched plates. Have a look at mine - the plates on it are Etched. Personally, I wouldn't waste the time making your own as those etched brass ones out there are to a very high standard already - better to channel your efforts into more exciting things! Hi Alan, thanks for the feedback. Having looked at an etched plate I have, I agree that it is probably the way to go. The main issue is cost with a set of plates costing somewhere between £5-£6, which is actually very reasonable until you consider that I have several locomotives to do and I'm presently unemployed which has the unfortunate knock on effect of funds being very tight. The total cost of the homemade version was around 15p in materials and around 15 minutes to make several sets (not including cutting out) so I think as a stopgap measure I'll continue with these and upgrade as and when funds improve - the current plates are only held in place with a dab of varnish. However in the case of my Shire class, this might be a problem as I've not found any etched plates for 'Lincolnshire' which was the only D49 allocated around London in LNER days (although I am in possession of an etched set for the BR Hunt). These were made mainly using materials I had to hand. Firstly you'll need a programme that can create shapes and text; I used my CAD software for this but I understand that word can be used for this (though don't ask me how). Once you're happy with the artwork print it using a black and white laser printer (it has to be a laser printer) onto acetate and check that you've got an even coverage of toner around any letters and beading. Getting the black to turn gold is where the clever bit happens, you need to have a laminator and some special gold transfer foil. The transfer foil is the only bit I purchased for this project and cost me £5 (free P+P) for a 15m long roll from ebay. Take your printed acetate and lay the foil over the top, place a couple of piece of paper over the acetate to protect it and run the whole lot through the laminator. Once cool (about 30 seconds), remove the foil and, where there is toner, you should now have some gold lettering. You might notice that the coverage on these plates is not perfect on the rejected set above, however by printing several you will end up with quite a few that are useable. All that remains is to carefully cut them (with a compass cutter in this case) out and apply to the model. Having looked at them compared to some etched plates following Alan's comments, they're not as good however they really do look the part on the model (to me anyway) and will do for the moment until I can justify spending quite a bit of money on replacement etched plates.